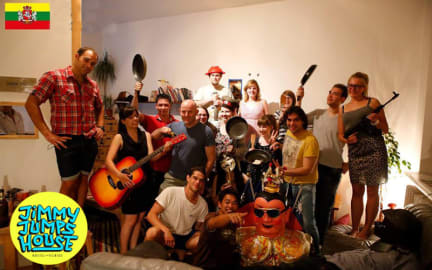 traduzido pelo Com 'um pequeno-almoço waffle livre para morrer "e" uma atmosfera de bem-at-home', o Jimmy Jumps Hostel não irá decepcionar. A pousada oferece um inventário impressionante de passeios e atividades (você pode tentar tudo de 'tours metralhadora' para 'saunas florestais) e com uma sala comum confortável e terraço ao ar livre, há muitas oportunidades de conhecer novas pessoas. Você pode chegar Jimmy Jumps facilmente da estação de ônibus central, e sua localização central faz com que seja fácil de explorar maiores sites da Cidade Velha. Confira a praça principal e da Câmara Municipal, a apenas 5 minutos a pé da porta da pousada frente. Chuveiros ótimos, equipe gentil e disposta a ajudar, super bem localizado e fácil de encontrar. The best hostel I spent on my trip through Europe! The staff is amazing. Marcelé, Normante and Gintare are super attentive and serve you very well! The best staff! 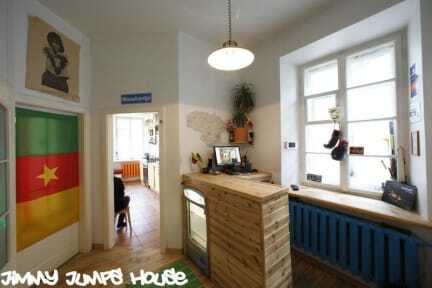 I just can thank Jimmy Jumps Hostel for my amazing time in Vilnius. Thank you a lot. The accomodation was pretty good, the breakfast were delicious and the staff were really chill. I did the pubcrawl and I tottally recomend it. Also, I for got some clothes in the Dorm when I've left, and they sent it by mail to my friends house!! That was really, really nice from them. The location is in the heart of the old town, no mistake. The hostel is clean and is well located. They have a simple but good breakfast. I recommend this place! The location of this hostel was perfect, just 3 minutes walking to the TownHall, close to supermarket, pubs and restaurants and other points of interest. The staff was very friendly and the waffles was very good too! Definitely recommend this hostel. Na cozinha não há fogão nem pia p lavar qq coisa, pois não é oferecido café da manhã pelo hotel. O cliente improvisa o seu dejejum nessa cozinha q tem uma geladeira e um chaleira p aquecer água. They have a regulation of taking out our shoes which, by theory, would be good, but it just leaves the place so so stinky! The dorms were smelly as well, the common room was way too small for the amount of people... They should have more rooms and not just one. The bathrooms were dirty and we didn't get a towel... The quality of internet was horrible and there wasn't enough sockets in the wall. The staff wasn't that nice and the breakfast only includes coffee and waffles. Don't go!! !